What moisturizer works for your child’s eczema? The topic of ‘moisturizer’ has always attracted a huge level of interest of parents with eczema babies and children. Like many parents, you may have spent tremendous amount of time and money trying out the right type of moisturizer that ‘works’ for your baby or child. Either it is by guesswork or by recommendation, the product may or may not work for you. If the skin doesn’t like the moisturizer, you return to ground zero and repeats the whole daunting search and trial process. 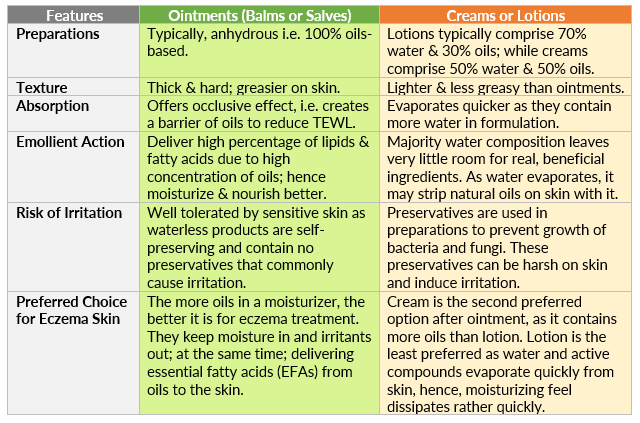 Selecting the right moisturizer will no longer be just a guesswork when you are now guided by an understanding of why you need to moisturize, how and when you should moisturize effectively and how different types of moisturizers work. Why is Moisturizing so Effective? Topical therapy or moisturizing with emollients remains the mainstay of skincare for dry skin conditions including eczema skin. Used for over 5 centuries, they have been proven to be a feasible, safe, well-tolerated and non-costly for long term and for all ages. In many cases, mild to moderate eczema can be successfully treated or relieved by using emollient (otherwise known as moisturizers) therapy alone. If used correctly as part of your child’s daily skincare regimen, they become your ‘effective and active treatment’ that you need. Its use can lead to control of eczema or reduced need of topical steroids or systematic drugs. Unfortunately, moisturizers are under-used because people often perceive them to be ‘inactive’ or ‘ineffective’; or they do not understand why they are so important in controlling, relieving, maintaining or preventing eczema. Soothe and relieve itch which is often induced by dryness. Reinforce skin barrier by producing an oily layer over the skin surface to prevent transepidermal water loss (TEWL). The restored skin barrier function helps prevent entry of irritants, allergens and bacteria that induce flares. A good skincare routine using moisturizers can calm, hydrate nourish and protect the impaired skin, minimizing the need for steroid preparations; which are then only necessary for flare ups in mild to moderate eczema. How and When to Moisturize Effectively? 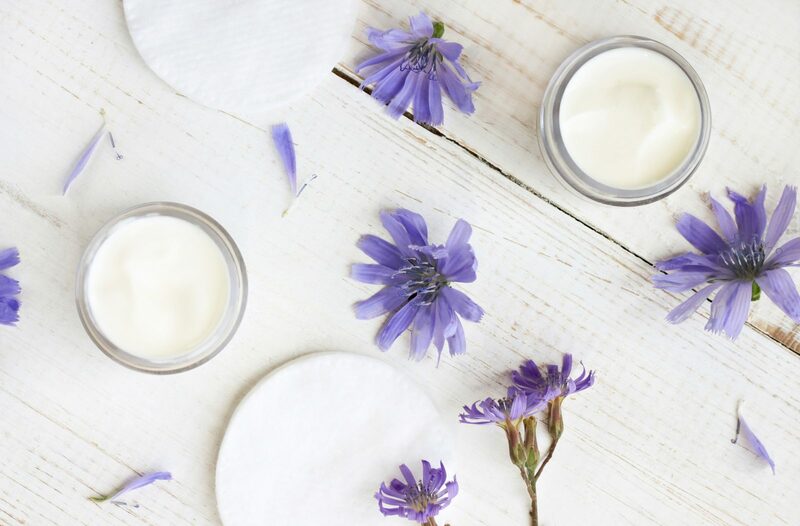 Moisturizers are not just about the products itself, but the key to successful and effective therapy with emollient also depends on how and when to use them! Now that we have established that moisturizing is compulsory, we need to ensure that your baby or child is moisturized enough. During bad days, you may need to moisturize more frequently up to 4 or 5 times daily until skin is normal looking. Moisturization during maintenance, when skin has normalized, is just as important as moisturizing is needed during flare ups or active eczema; in which case, aim to moisturize at least twice daily. There was study that showed people who moisturize more pay less visits to the physician. Apply liberal amount of moisturizers not just on areas of affected skin but should be extended to larger section of the body. Dryness is a clinical feature of eczema and result of TEWL; and very often, other normal-looking, uninvolved skin surfaces of babies or children predisposed to dryness conceal altered condition that may progress or develop later. The best time to moisturize is immediately (i.e. within 3 minutes) after shower or bath, while water is still trapped in the skin for optimal and extra hydration. You can apply as frequently as required (every hour if the skin is very dry); at every diaper change can be a good reminder. If you use a prescription topical medication, apply it as directed, before you moisturize. It is also important to maintain some 45 minutes to an hour in between both treatments. This is to avoid diluting the strength of the topical steroid preparation as well as to prevent the steroid from spreading to unaffected skin area. • Try to avoid dipping hands into your tub or jar of emollient cream. Instead, use a spatula or any clean implement to scoop the right amount each time and replace the lid immediately to prevent contamination. • Soften moisturizer by rubbing it between your palms and apply to your child’s body. Finding a right moisturizer works comes with trials and errors. What works for a person may not work for another and as the condition of a baby or child’s skin changes, so can the efficacy of a moisturizer. In Making the Right Choice: Understanding and Using Products for Eczema Skin, let’s look at some key criteria that should form your basis for decision-making when finding your right moisturizer for eczema; and some keywords for parents to identify and understand skincare products they use for the sensitive eczema skin of their babies and children. This entry was posted in Baby Eczema, Eczema & Dermatitis, Eczema & Moisturizing and tagged baby eczema and moisturizer, different types of moisturizer for eczema, effective moisturizing in eczema, emollient and eczema, how to moisturize for eczema, right moisturizer for eczema.